Phototropism is a phenomenon where organisms grow in response to light. As an energy resource and also sensible light source, the sun is one of the most important factors in building design, especially in cold or hot climates. The San Francisco annual temperature data shows that most of the days during a year, the temperature is lower than the comfort zone. The importance to maximize solar heat gain is not only for reducing heating load, but also to create a more sustainable living environment. The Phototropic house introduces the concept of living space growing toward the solar energy resource to maximize solar heat gain throughout the year. In order to provide each residential unit with maximum solar exposure, the individual units have been strategically positioned by the following steps. No North Facing Units: Most units are positioned toward southeast or southwest with a minimum number of units facing east. Living Rooms projects out, Bed Rooms recess in: The living room is the major space for daytime usage while the bedroom is more for night time usage. Through projecting the living out room out, the living room becomes a brighter space with excellent view toward the street. In contrast the bedroom will have higher solid to glass ratio with stronger insulation to minimize night time heat loss. Tilt the Facades toward the sun: By tilting the main facades toward south, each unit will have better exposure toward the sun which will not only improve the day lighting condition, but also will provide better solar heat gain throughout the year. Incident solar radiation studies show the characteristics of each orientation. In the surface radiation plots, the dark blue is night time (no sunlight), the light blue is heating period, and sky blue indicates comfort range. The red cells mean cooling-needed as it is beyond the comfort range. The south façade is beneficial in this climate as it gets more sun in winter but less in summer. However, the west façade gets a lot of solar radiation in the afternoon of summer which is not preferable. Therefore, the articulated facade design which allows the building to maximize southern exposure was introduced in the early stage of design. The south and west façade modules are tilted towards the true south direction to get the optimal solar gain and loss throughout the year. The Central Atrium is a passive design feature which improves the indoor environmental quality through providing operable openings for natural ventilation. During summer the skylight and windows in the corridor will be opened to introduce natural ventilation while during winter all openings will be closed to minimize heat loss. Each Residential unit will have operable louvers which will open toward the atrium to create cross ventilation. 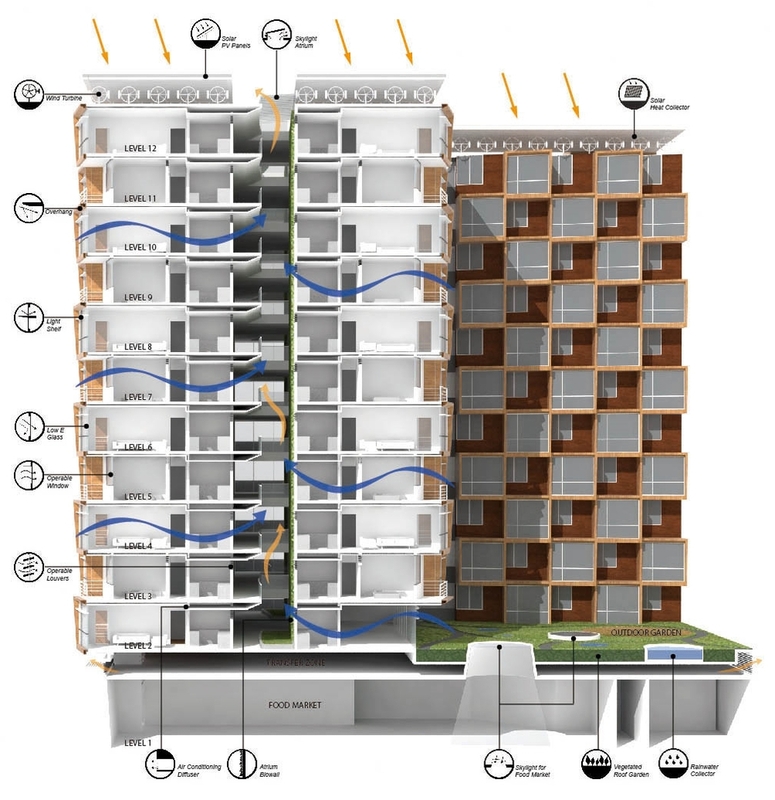 In order to achieve net zero energy, the Phototropic Housing incorporates multiple design passive and active strategies to reduce heating and cooling load as well as utilizing on site renewable energy resources. In order to optimize the building design to meet ZNE requirement, energy modeling and simulation tests have been performed using IES-VE according to different conditions which are compared to the ASHRAE 90.1 baseline building. The proposed design incorporates active systems to reduce the building loads. When all energy efficiency measures are implemented, the results of the whole building simulation show that the proposed design performs 50% better than ASHRAE 90.1 Baseline building in energy use. Step 1. Proposed Design: The proposed design includes the heat transfer loop with ground source heat pump and sun shading on to the each envelop as well as lighting power reduction. These three was the main factor of reducing the EUI from 32.15 kBtu/ ft2 to 13.75 kBtu/ ft2, which is 53% decrease. Mostly, cooling energy, domestic hot water as well as fan energy reduced in the proposed design. Heating load increases while Cooling load decreases because of the shading devices, however the overall sum of the Heating and Cooling load is significantly reduced. Heating Load was initially low because of the orientation of residential units, however for the proposed design, there is a significant reduction in Domestic Hot Water. Step 2. High Performance Glazing, larger SHGC: The second energy saving strategy is to use high performance glass with low U-value (0.16) with relatively high SHGC (0.32) and VLT (60%). This glazing system helps to increase a bit of cooling energy as SHGC is higher than baseline (0.25), but the decrease in heating energy is a lot more- passive solar effect. the street. Step 3. Natural Ventilation: The third strategy is natural ventilation in the atrium. It reduces for about 15% of cooling and fan energy consumption. At last, after combining these energy savings we can theoretically balance off the load and renewable energy to achieve new zero. The total EUI of the building is 12.88kBtu/ ft2 and the total renewable energy saving is 13.09kBtu/ ft2. Therefore, the total EUI of this site is -0.21kBtu/ ft2 which mean we have a bit more energy generation than consumption which we can give back to the grid. As the graph shows, heating and cooling energy is relatively small due to passive design, orientation optimization, high efficiency building envelope and ground source heating and cooling. The remaining energy consumption loads are the unregulated loads, building appliances and tenant lighting. It is assumed that the building receives a major boost in energy efficiency from the use of an efficient, well-designed mechanical system with geothermal heat pumps and wells. It is assumed that the COP of the heat pumps in heating and cooling mode are 5 which is higher than average (3). Use of geothermal heat pumps makes a significant impact in net zero site energy calculations, because the amount of energy consumed on site is far less than a natural gas boiler, due to the COP of the heat pump.